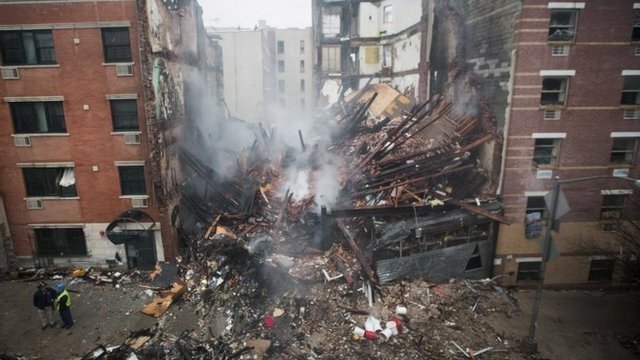 At least six people are dead, several are missing and dozens are injured in East Harlem buildings collapse after a gas leak sparked a powerful explosion leveled the New York City blocks. Rescue crews began searching the debris on Wednesday evening for victims after the fire was finally put out. Train services to and from Grand Central Terminal have been restored after a complete halt earlier. As the search-and-rescue operation continued under floodlights on Wednesday night, the emergency services confirmed that the death toll had risen first to four, then to five and to six, with several people still missing. Earlier, NYC Mayor Bill de Blasio said in a news conference from the scene that the gas leak had been reported to the utility company 15 minutes before the blast on Wednesday morning. Bill de Blasio said the “major explosion” had destroyed two buildings and heavily damaged other structures. As night fell, rescue crews were finally able to search for victims in the debris after the fire raged for most of the day. Heavy equipment, including a bulldozer, helped clear the remnants of two multi-storey buildings. Thermal imaging cameras were brought in to identify bodies or pockets of fire inside the mountain of debris. The New York fire department said 22 people had been hurt, but a tally of local hospitals by ABC News found that 64 had been admitted with injuries as a result of the incident. That figure included seven children, one of whom was in a critical condition. The utility company, Con Edison, says a resident in a nearby building reported smelling gas shortly before the explosion. Streets and pavements around the site were littered with broken glass from shattered windows. The blast scattered debris across nearby rooftops, correspondents say, destroying adjoining five-storey buildings in a largely Latino working-class neighborhood. Witnesses reported the powerful blast knocked items off shelves in nearby stores.